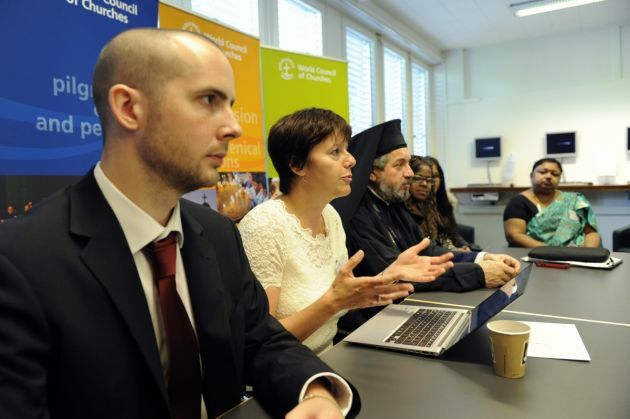 (Photo: WCC / Peter Williams)At a press conference on climate change on July 4, 2014, Daniel Murphy (L) of the Environmental Justice Foundation, Kirsten Auken (center) of the Evangelical Lutheran Church in Denmark, DanChurchAid and Metropolitan Serafim Kykotis (R), Greek Orthodox Patriarchate of Alexandria and All Africa announce the holding of an Interfaith Summit on Climate Change in New York City, along with Religions for Peace. The World Council of Churches said Friday it will hold a September Interfaith Summit on Climate Change in New York City, along with Religions for Peace. More than 30 religious leaders will take a united stand to encourage international and political leaders to address concretely the causes and consequences of climate change, the WCC said in a statement. "The relevance is unprecedented because of the crucial moment we are living today. "We have called for years to have a fair, ambitious and binding treaty on climate change," said Dr. Guillermo Kerber, coordinator of the WCC programme on Care for Creation and Climate Justice. The 30 participants at the summit will represent groups made up of Christians, Jews, Muslims, Hindus, Buddhists, Indigenous Peoples, and others, said Kerber. The interfaith summit is being held immediately before the United Nations Climate Summit, called by U.N. Secretary General Ban Ki-Moon, to galvanize and catalyze climate action. It is hoped it will bring bold announcements and actions that will reduce emissions, strengthen climate resilience, and mobilize political will for a meaningful legal agreement in 2015. WCC members said they hoped their united voice would be also heard at the upcoming Conferences of Parties of the U.N. Framework Convention on Climate Change in Lima in December 2014 and in Paris in 2015. "We will join our voices in the call for human rights and climate change to be addressed systematically," said Daniel Murphy, campaigns assistant at the UK-based Environmental Justice Foundation. Murphy spoke about increasing climate-induced displacements, as well as how conflicts are fuelled due to the impact of climate change. He cited Syria, where the drought between 2006 and 2010 was a driving factor behind mass migration to the cities, resulting in social and economic pressures exploding a national crisis further into political instability. The WCC is a church grouping representing 560 million Christians from mainly Anglican, Orthodox and Protestant traditions. Murphy spoke to the WCC Central Committee, its main governing body, which met in Geneva during the week. The world church body has addressed climate change for more than two decades, and now its effects of climate change on human rights have reached an urgent level, said Kirsten Auken, an advocacy advisor at DanChurchAid. The advisor for the Danish nonprofit with the mission of supporting the world's poorest people, said the main message of the interfaith summit will be that "political leaders need to act to close the gap between what is needed and the lack of action on a political level. "We, as church-related and faith-based groups, have an important role to play in pushing our leaders to be brave." She said the religious groups need to capture the attention of political leaders who are in a position to make a difference within the United Nations. "This is a big power game and we have to admit that," said Auken. "We have to be the moral voice in this." Metropolitan Serafim Kykkotis, Greek Orthodox Patriarchate of Alexandria and All Africa said, "We must unite through our common action to save the planet and give our children a better future." He said, "Humanity's reckless consumption of earth's resources threatens us with irreversible climate change. Burning more fuel than we need, we contribute to droughts or floods thousands of miles away."